Most people are aware of the importance of rest and recovery after training, but many of us still tend to overtrain and feel guilty about taking a day off. In reality, the time between training sessions is when your body is actually repairing itself and strengthening, not during. Rest days give your body time to adapt to the stress you put it through each day with heavy weights, dynamic movements, and high intensity training. You’re only getting stronger when your muscles have time to repair themselves. Exercise depletes your energy stores and causes muscle tissue breakdown and and fluid loss. Recovery and rest (read: sleep) allows these stores to be replenished and your muscle tissue to repair itself — aka muscle building, which is what we all want, right? If you feel like you’ve been spinning your wheels in the gym and not seeing the improvements you want, you may need to throw in a few more rest days and upgrade your sleep schedule. There are limits to how much stress the body can tolerate before it breaks down. What your body can handle depends on a ton of factors: Your fitness level, training frequency, genetics, diet, how hard you push yourself during each session and more. Once you’ve reached this limit, your injury rate increases and you stop making progress. Once you’re overtrained, it’s difficult to come back quickly. Get ahead of it before it becomes a problem. Symptoms of overtraining include general fatigue, increased muscle soreness, trouble sleeping, significantly increased appetite, lack of motivation, weight gain … The list goes on. Now that you know the the why, let’s talk about the how. How do we rest and recover properly and efficiently? Unless you’re an athlete who’s training 2+ hours every day, there’s no need to spend hours mobilizing, stretching, taking ice baths, getting acupuncture, massages, body work (although once in a while is great), and Compex-ing or Theragun-ing every muscle group. The most important thing you can do for your body is sleep. I can’t stress enough the importance of getting adequate sleep. Whether your goals pertain to performance or aesthetics, sleep is vital to getting you there. Aim for 7 to 10 hours a night, and get to bed early. Secondly, hydration is crazy important for recovery and performance. Start every day by chugging a glass of water, and aim to drink a gallon a day (16 8-ounce glasses). The recommendation of eight glasses a day is bare minimum. Bring a water bottle to work and try to fill it up at least four times throughout the day. Fruit (try berries or lemon), BCAAs or some flavor drops can make getting your water in a little easier if you struggle to drink throughout the day. Nutrition is the third building block for proper recovery. Not sure where to start? 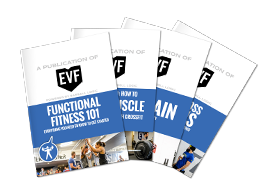 Check out our EVF Nutrition program. You want to make sure you have the right balance of protein, fat, and carbs. (Yes, you need carbs if you want to get stronger.) You have to eat enough to support recovery and performance, but not so much to increase body fat. It’s a delicate balance, and our nutrition program can help you find it. Finally, proper stretching and mobility will tie everything together. You should be stretching every day to some extent. It doesn’t have to be immediately after your workout. Any time during the day or before you go to bed works fine. Take a yoga class, do some stretches on your own while you wind down for the night, or check out ROMWOD. 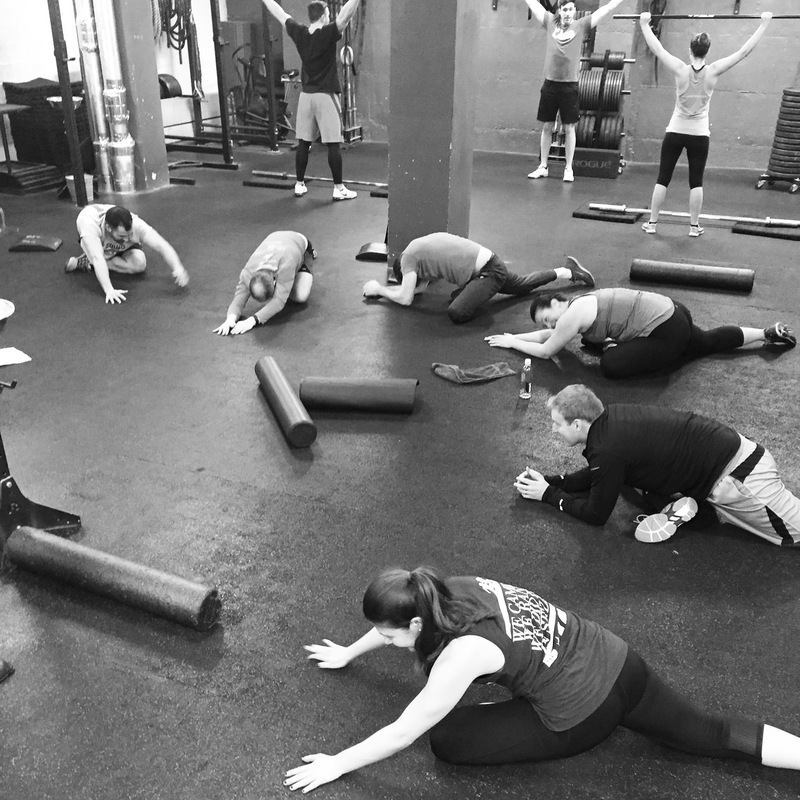 You can also spend some time doing myofascial release — grab a foam roller or lacrosse ball and work out some tight spots, or get a massage from time to time. If you’ve worked out especially hard and are in extra pain, ice baths, compression (Freeze Sleeves, Normatec), and/or muscle stimulation (Compex, Powerdot) are all great for aiding recovery. We can’t just simply train hard. We have to train smart, and smart training includes rest days. Prioritize sleep, hydration, nutrition, and mobility. You’ll be amazed at how much better you feel in and out of the gym, and the PRs will come rolling in! Simply choose your experience level and get registered for EVF Performance today! EVF Upper East Side1623 York Ave.
EVF Columbus Circle559 West 59th St.